Versatility for high pressure applications across a wide flow measurement range. 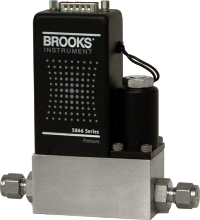 The Brooks model 5866RT metal or elastomer sealed pressure controller and flow meter controls pressure while also measuring flow rate. Model 5866RT receives a remote pressure transducer signal, and using adjustable integral PID control electronics and control valve, will maintain a desired set pressure. With options in seals, electro-polished wetted surfaces and a wide pressure and flow measurement range, 5866RT delivers proven results across a broad range of processes.